A conventional septic system consists primarily of two components, the septic tank and the drainfield. 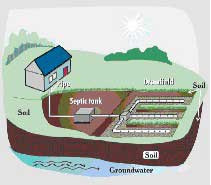 The septic tank provides some treatment to the wastewater while retaining the solids. Distribution/disposal of the wastewater occurs in the drainfield. Drainfield materials can be rock/pipe, chambers or multi-pipe. Each of these materials allows the effluent to be dispersed in the soil where final treatment occurs. A conventional system is installed below the ground surface where the soil/groundwater conditions are good. These systems are usually gravity fed (no pumps required) due to the depth of installation. A mound system is required when soil or groundwater conditions are as such that a “below grade” drainfield cannot be installed. This type of system typically requires a pump as the drainfield is higher than the outlet of the septic tank. A raised or mound system is required in areas where an elevated groundwater table is present.